PIERRO (AUS) (Bay 2009-Stud 2013). Leading 3YO Male on the 2013 WTR (Sprint). Champion 2YO in Australia in 2011-12. 11 wins-6 at 2-from 1000m to 1600m, A$4,536,650, ATC Golden Slipper S., Gr.1, Sires' Produce S., Gr.1, Champagne S., Gr.1, Canterbury S., Gr.1, George Ryder S., Gr.1, Silver Slipper S., Gr.2. Out of a half-sister to SW Laverock (Longchamp Prix d’Ispahan, Gr.1). Sire of SP Tulip and of the placegetters Ipso Facto, etc. His oldest progeny are 2YOs. SIRANI, by Galileo. 3 wins from 2100m to 2400m, ARC Perfectly Ready H., Barfoot & Thompson H., 3d Counties RC HR Fisken & Sons Ltd H., Matamata RC Colchester Engineering Ltd H. Half-sister to BLACK MAMBA, Gussy Godiva (dam of ROMAN EMPEROR, RIOS). This is her second foal. Her first foal is unraced. BLACK MAMBA (Black Minnaloushe). 7 wins from 1600m to 2400m, US$966,686, NZ$20,500, Del Mar John C Mabee H., Gr.1, Hollywood Park Beverly Hills H., Gr.2-twice, Keeneland Dowager S., L, Del Mar CTT & Thoroughbred Owners of California H., L, Allowance, 2d Del Mar Palomar H., Gr.2, Hollywood Park Dahlia H., Gr.2, Santa Anita Buena Vista H., Gr.2, Santa Barbara H., Gr.2-twice, Oak Tree Las Palmas H., Gr.2, ARC Twilight Racing 3YO H., 3d Oak Tree Yellow Ribbon S., Gr.1-3 times, Santa Anita American Beauty H., L, 4th Hollywood Turf Cup, Gr.1, Hollywood Park Gamely S., Gr.1, Masterton RC Lowland S., Gr.3. Producer. Lazy Buddies. 7 wins at 1650m, 1800m, HK$3,772,351, HKJC Yunnan H., Yik Yam H., Miss Asia 2005 H., Pollock H., Nam Kok H., Tai Ho H., Perfect Heart Collection H., 2d HKJC Smashing Pumpkin H., Tak Ku Ling H., News Magazine H., Old Bailey H., Massey University H., Sha Kok H., Salisbury H.
Lucky Stravinsky. 4 wins-1 at 2-at 1000m, 1200m, HK$3,208,500, HKJC Duddell P., Shanghai H., Community Chest Cup H., Devon H., 2d HKJC Scmp.com H., Silver Lining H., Showbiz Update P., Kowloon Tong P., Wistaria P., 3d HKJC Admiralty H., Harlech H., Flying Dancer H.
ROMAN EMPEROR (Montjeu). Second on 2008-09 Australasian 3YO Classification (long). 2 wins at 1550m, 2400m, A$1,416,800, Australian Derby, Gr.1, AJC Alm H., 2d MRC Caulfield Cup, Gr.1, STC Rabbitohs to 8000 Members H., 3d STC Hill S., Gr.2. Sire. RIOS (Hussonet). 6 wins from 1400m to 1600m, NZ$250,750, A$58,750, Wellington Guineas, Gr.2, ARC Bonecrusher S., L, Feilding JC Anzac H., L, Waikato RC Kowhai Farm H., Hawkes Bay Zee U at Zabeels H., Wine Country H., 2d STC Tulloch S., Gr.2, BOP RC Ultimate Motor Group Ford 3YO H., 3d New Zealand Two Thousand Guineas, Gr.1. Sire. Sirani. 3 wins. See above. Info Miss. 3 wins to 1550m, STC Vodka Cruiser H., 2d STC Bidvest Stephensons Foodservices H., 3d STC Project Sales (Qld) H. Producer. Galaxee. Winner at 2000m, HKJC Tai Shing Stream H., 2d HKJC On Lan H., 3d HKJC Philadelphia H., Pottinger Peak H.
TULLY THUNDER (Thunder Gulch). 4 wins-1 at 2-at 1350m, 2000m, A$420,950, SAJC Australasian Oaks, Gr.1, Oaklands P., L, VRC Comic Court H., MRC Select H., 2d South Australian Oaks, Gr.1, SAJC Sires' Produce S., Gr.3, Auraria S., Gr.3, 3d MRC JJ Liston S., Gr.2, SAJC Alcohol Go-Easy S., L, MRC Robert Taranto H., Macquarie H., SAJC Carlton Draught 2YO H., 4th VRC Wakeful S., Gr.2, MRC Geoffrey Bellmaine S., L. Producer. SUFFICIENT (Zabeel). 2 wins-1 at 2-at 1600m, ARC Champagne S., L, Mitty's H., 2d ARC Cambridge Stud 3YO H., Legends Fellowship 2YO H. Sire. 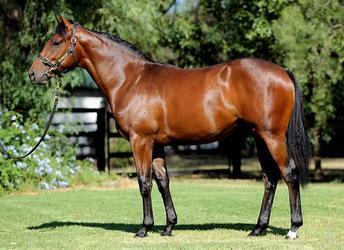 ZAMZAM (Redoute's Choice). 2 wins at 2, A$236,400, in 2015-16, MVRC Valley Pearl, L, City Jeep 2YO P., 3d MRC Blue Diamond S., Gr.1. Londehero (Lonhro). 7 wins to 1200m, A$425,100, to 2016-17, BRC Canadian Club H., Yellowglen H., 2d GCTC Ken Russell Memorial Classic, L, 3d BRC Phelan Ready S., L.
IRISH FLAME (Zed). Winner at 2 in 2016-17, Taranaki 2YO Classic, Gr.3. THUNDER LADY (Mastercraftsman). Winner at 2000m, NZ$750, A$466,775, VRC Wakeful S., Gr.2, 2d VRC Oaks, Gr.1, Benalla Gold Cup, 3d ATC Vinery Stud S., Gr.1. SNEETCH (Grosvenor). 3 wins. See above. KILDARE (O'Reilly). 4 wins at 1000m, 1400m, NZ$5,000, HK$3,112,550 in NZ and HK, HKJC Chow Tai Fook Bauhinia Sprint Trophy, HK-3, Beijing Clubhouse H., Tai Mo Shan H., 3d HKJC Cheung Hong H.
ONE LOVE (Danasinga). 7 wins from 1200m to 1600m, NZ$142,099, Otago RC New Zealand Bloodstock Insurance S., L, 2d CJC Timaru S., L-twice, Hororata RC South Island Thoroughbred Breeders' S, L, 3d CJC Canterbury Breeders' S., L. Producer. GLORIOUS DAYS (Hussonet). 8 wins from 1200m to 1600m, NZ$6,250, HK$32,895,000 in NZ and HK, Longines Hong Kong Mile, Gr.1, HKJC Jockey Club Mile, Gr.2, Stewards' Cup, HK-1, Chinese New Year Cup, Hoi Ping H., Chevalier Construction H., Midland Holdings Cup, 2d Longines Hong Kong Mile, Gr.1, HKJC BMW Champions Mile, Gr.1, Queen's Silver Jubilee Cup, HK-1, Chairman's Trophy, HK-2, Oriental Watch Sha Tin Trophy, HK-2, 3d HKJC Queen's Silver Jubilee Cup, HK-1, 4th HKJC Champions Mile, Gr.1-twice. BANGALORE BULLET - BRIGHT STAR (H.K.) (Hussonet). 6 wins to 1400m, NZ$67,725, HK$2,415,850, Otago RC Dunedin Guineas, L, Gore Guineas, L, HKJC Hung To H., Stubbs H.
SPURCENT (Flying Spur). 3 wins-2 at 2-at 1000m, 1200m, A$261,450, AJC Gimcrack S., L, 2d AJC Toy Show H., L, 3d MRC Thousand Guineas, Gr.1, NSW Tatt's RC Furious S., Gr.3. Producer. ALL LEGAL (Al Maher). 6 wins from 1300m to 1600m, A$596,430, ATC Villiers S., Gr.2, Hawkesbury RC Ladies Day Cup, L, AJC Schweppes H., Sanders Noonan H., City Tatt's RC Inglis Bonus 3YO H., 2d AJC Inglis 2YO Classic, Schweppes H., 3d AJC South Pacific Classic, Gr.3, Hawkesbury Guineas, L, STC Golden Slipper Festival on Sale 2YO H.
TIE ME DOWN (Pins). 5 wins from 1300m to 1600m, NZ$81,060, Wairarapa Thoroughbred Breeders' S., L, Manawatu RC Murphy Properties H., 2d Wanganui JC Dave Hoskin Carriers H., 3d Manawatu RC Tru Test H.
BELCENTRA (Bel Esprit). 3 wins to 1400m, A$219,200, VRC Desirable S., L, MVRC NHP Electrical H., 2d MRC Blue Diamond Prelude (f), Gr.3, 3d MRC Thoroughbred Club S., Gr.3. Producer.